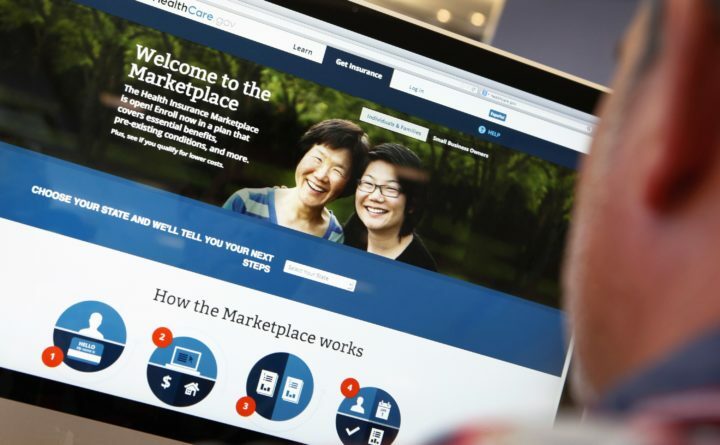 A man looks over the Affordable Care Act (commonly known as Obamacare) signup page on the HealthCare.gov website in New York in this October 2, 2013 photo illustration. The number of Mainers without health insurance held steady in 2016, as the national uninsured rate fell to a record low, according to new U.S. Census data. Eight percent of Maine residents, or 106,000 people, lacked health insurance last year, the Census report released Tuesday shows. That’s down slightly from 8.4 percent in 2015, though within the report’s margin of error. Maine’s rate remained below the national uninsured rate, which dropped to 8.6 percent last year from 9.4 percent in 2015. The uninsured rate has decreased in all 50 states since 2013, just prior to the Affordable Care Act’s broadening of coverage through expanding Medicaid and launch of the insurance marketplace Healthcare.gov. Maine’s rate is down from 11.2 percent, or 147,000 residents, in 2013. Uninsured rates have dropped the most among the 31 states that expanded Medicaid, the federal-state health insurance program for low-income Americans. States that expanded Medicaid had an average uninsured rate of 6.5 percent, compared with 11.7 percent among states including Maine that did not, the Census Bureau reported. Maine voters are now charged with deciding whether to expand Medicaid, known as MaineCare, in a Nov. 7 referendum. The citizen initiative follows at least six failed attempts to expand the program through the Legislature under Republican Gov. Paul LePage. Maine was among about a dozen states that saw no significant change in their uninsured rates last year. Maine’s uninsured rate was comparatively low before the ACA thanks to Dirigo Health, said Mitchell Stein, an independent health policy consultant. Dirigo, a now-defunct initiative of former Maine Gov. John Baldacci, offered coverage through a state government partnership with Harvard Pilgrim Health Care. Health advocates have since helped to enroll many Mainers in Healthcare.gov plans, Stein said. That primarily leaves as uninsured the individuals who would be eligible for Medicaid if Maine expanded the program, he said. Advocates of the ACA have urged the Republican-controlled Congress to preserve the historic coverage gains as they debate plans to replace the 2010 health reform law. The Census report also showed that most Americans continue to get health coverage through work, with 55.7 percent relying on a plan through their employer. Just over 37 percent get coverage through government programs such as Medicare and Medicaid, though that share is growing.